7/19 Cup of Coffee: Outside of the DSL, runs were at a premium on Wednesday night as Red Sox affiliates went 4-2 in stateside games but none of the affiliates scored more than three runs, and two were shut out. Tyler Esplin walked off in the second half of Lowell's doubleheader and did his best to overshadow teammate Eduard Bazardo's (pictured) complete game, nine strikeout game in the morning session. Drew Pomeranz also improved in his latest rehab start with one hit in six innings. Despite Ivan De Jesus' three hits, the PawSox were shut out. A rehabbing Drew Pomeranz did his part, pitching six one-hit innings. His only mistake was a solo home run, going along with a pair of walks and five punchouts. Josh D. Smith gave up a run in each of the seventh and eighth innings, giving four free passes against two strikeouts. Tony Renda also had a multi-hit evening. Jhon Nunez delivered the game-winning base knock in a contest where runs were at a premium with an RBI single in the seventh inning, and Josh Ockimey drove in the other Portland run with a triple in the first. Jantzen Witte had two hits, and Mike Shawaryn delivered six strong frames, allowing one hit on six hits. He struck out six and walked one. Travis Lakins pitched a perfect ninth to close it out, striking out each of the three batters he faced. The runner starting on second did Salem in, as a sacrifice bunt followed by a sacrifice fly gave the Astros the win as the Red Sox were one-hit. It negated a great six innings from Tanner Houck, who struck out seven in six innings against one walk. Yankory Pimentel also pitched two perfect innings, and despite surrendering one hit in 1 2/3 innings, Jake Cosart was served the loss. Despite getting three-hit, the Spinners were able to generate enough offense to not waste Eduard Bazardo's complete-game effort in the early half of the twin bill. Bazardo allowed only an unearned run on four hits with nine strikeouts. Devlin Granberg had two RBI, opening the scoring with a fourth-inning solo shot. 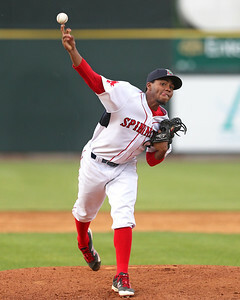 The Spinners added a pair of runs in the sixth on a Jarren Duran triple. He would come home on a Granberg sacrifice fly. Tyler Esplin played hero in the afternoon session with a walk-off single through the right side, negating Aberdeen's two-run first inning. Taylor Ahearn allowed both Iron Bird runs, before ceding the ball to an effective bullpen combination of Danny Bethea, Marcus Walden, Francisco Lopez-Soto and Victor Garcia. They pitched six shutout innings, with Walden and Lopez-Soto delivering no-hit frames, despite the latter's three walks. A trio of errors in the ninth gave the Red Sox two runs in the ninth to give them their second consecutive win. Juan Carlos Abreu drilled a double and triple, adding an RBI in the fourth. Carlos Pulido also had two hits from behind the plate, combining for four of the squad's six base knocks. Edison Batista allowed a pair of unearned runs on just one hit in three frames, and Logan Browning followed it up with three more one-hit innings with four strikeouts. Brenier Licona drilled a three-run home run as part of a four-run fourth that helped the Red Sox hold off a Braves' comeback in the late innings. Emerson Ortiz gave his team a four-inning start, allowing three runs (two earned) on six hits. He walked one and struck out three, while Carlos Cortez struggled with his control, walking five in one inning of work. Ceddanne Rafaela, Carlos Sanchez, and Denny Daza each had two hits with an RBI as well. The Red Sox were up 3-1 after the top of the sixth, but Johan Martinez surrendered four runs in the bottom of the sixth as he walked four to go along with a hit in 2/3 of an inning and that proved the difference. Nelfy Abreu, Kleiber Rodriguez, and Ronaldo Pulgar each delivered two base knocks, with Abreu and Pulgar adding a double. Player of the Night: In his first full season stateside, Eduard Bazardo has been lighting it up for Lowell. In seven starts spanning 39 innings, the 22-year-old has walked just four batters to 46 strikeouts and has allowed batters to hit .174 against him. The sparkling walk numbers combined with a lack of hits means a 0.74 WHIP for the Venezuelan.